This is according to the World Nuclear Association, which describes itself as “the only international industry organisation with a global mandate to communicate about nuclear energy”, and has members which include Rosatom, the Russian nuclear power company, as well as Areva of France, KEPCO of Korea, and many others. 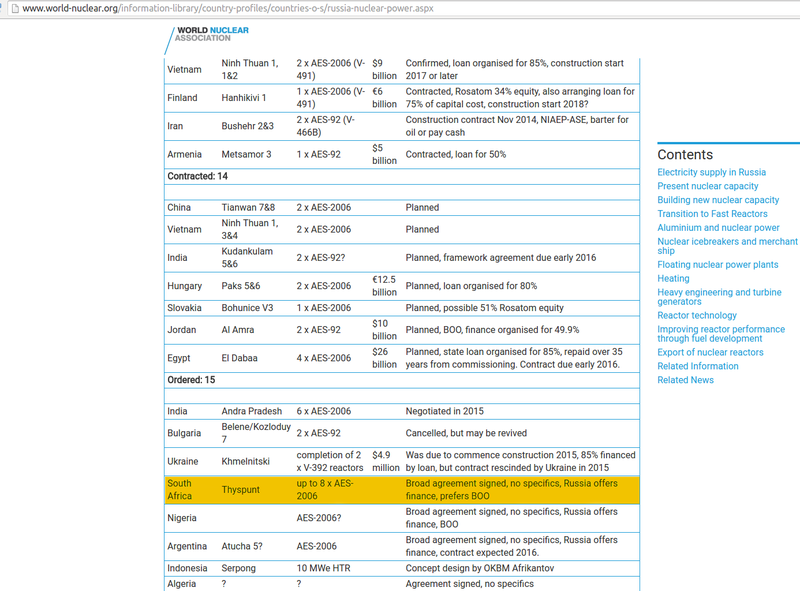 This screen shot taken from the site shows that South Africa is on the list of countries who have ordered nuclear reactors from Rosatom, and includes Thyspunt as the site, and the reactor design as the AES-2006 (also known as the VVER-1200 or NPP-2006). This makes a mockery of some of the processes being followed by the South African government. The EIA will select the best site? A key feature of an EIA is that is must include alternatives, including the option of not going ahead with the project, as well as alternative sites. The EIA report is now with the Minister of Environmental affairs, who is yet to make a decision. While the report recommends Thyspunt, it is up to the Minister to follow that recommendation or not. It is clear from the website above that Rosatom is under the impression that the installation site has already been agreed. The procurement process will be fair, equitable and transparent… ? If you have ever bargained for something, you will know that starting out by telling the seller that you will definitely buy the item, and then raising the issue of cost, is not a good strategy. The implication is that you will pay whatever it takes. Various government officials have said that the procurement process will be fair, equitable and transparent, such as here, and in papers submitted to the High Court in response to the SAFCEI case. On the other hand, it appears from the above that Rosatom have already been told they will supply the reactors, which design has been selected, and even the site at which they will be installed. Either Rosatom is lying, or they have indeed been told they have won the tender process, and the South African government is perpetuating a massive and expensive fraud on the people of South Africa, including conducting a sham EIA for R40 million, and defending themselves in another unwinnable case in the High Court. This entry was posted in EIA, Government, International and tagged government, International nuclear agreement, nuclear energy, Rosatom, Russian. Bookmark the permalink.